Solid waste disposal presents challenges to both residents and municipal authorities in Kathmandu—but opportunity for some creative entrepreneurs. Vermicomposting, a process of using worms and micro-organisms to turn kitchen waste into nutrient-rich humus, is an easy process that everyone can adopt at home, but requires some basic planning and materials for success. Global Peace Association Nepal in collaboration with the Solid Waste Management and Technical Support Center, Ministry of Local Government, organized a seminar on vermicomposting to learn from composting experts and facilitate the exchange of ideas and practices. More than seventy representatives from government agencies and NGOs, entrepreneurs, composters, students, and media attended the seminar on June 10, 2012. Vermicomposting materials exhibited during the seminar. Dr. Kishor Rajbhandari, President of GPA Nepal; Mrs. Yankila Sherpa, Former Minister of State for Culture, Tourism & Civil Aviation of Nepal; Er. Ganesh Shah, Former Minister of Environment Science & Technology; Dr. Sumitra Amatya, CEO of Solid Waste Management and Technical Support Center; Prof. Dr. Ananda Shova Tamrakar, a vermicomposting expert and professor of Tribhuvan University; and Mr. Bindu Raj Adhikari, Member-Secretary of River of Peace Campaign, spoke at the first session and explained the principles of vermicomposting as well as practical measures to manage waste segregation at home. 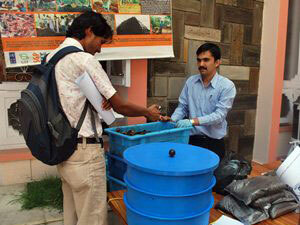 Two technical sessions included presentations by vermicomposting practitioners. Dr. Jaya Ram Adhikari, Undersecretary of Ministry of Environment Science & Technology, explained what materials and types of worms are used in vermicomposting and effective integration of vermicomposting in organic farming. A good alternative to chemical fertilizer, he said, vermicompost saves money, improves the soil, is good for small scale agriculture, helps in carbon sequestration, and conserves energy. Food produced from vermicompost is also healthier, he added. Mr. Hum Narayan Shrestha, a vermicomposting practitioner and a lecturer at the Trinity College, said that due to lack of public awareness vermicomposting “hasn’t been disseminated and implemented properly.” He gave an overview of a vermicomposting pilot project in the households of Kirtipur district, which he monitors once a month. He said participating households have learned the techniques, and the concept of waste management through vermicomposting is being spread in the district. 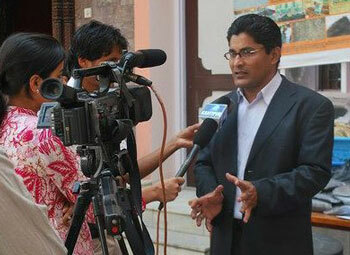 Mr. Ashok Kumar Bhattarai, Director of Praramva Biotech Pvt. Ltd, which produces vermicompost, explained waste management policies and laws in the country, the hazardous effects of mismanagement of solid wastes, the challenges that the agriculture sector is facing and the advantages and benefits of practicing vermicomposting. “Vermicomposting is one of the best techniques for organic waste management so we have to work and support the organizations working on biotechnology [agriculture and environment]. We need umbrella organizations which will bring all farmers and experts together to play an important role in policy making in agriculture field and waste management,” he said. 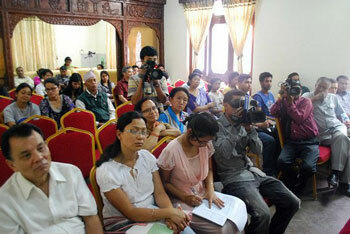 The event was covered by major television, radio and newspaper networks and supported by Trans Himalayan Environment and Livelihood Program, Pesticide Monitor Nepal and Global Peace Youth Corps Nepal.